For residents in VA Beach, air conditioners are crucial for maintaining a cool and comfortable indoor environment. They are especially important during the sweltering summer months. In workplaces, they’re great for combating the mental sluggishness that people experience on days that are just too hot. Employees are able to work more efficiently and make better decisions. At home, an air-conditioned room allows you to rest more comfortably. With the cool air from the AC unit circulating in your room, you can enjoy a good night’s sleep. You’ll wake up refreshed and ready to face another day. Air conditioning is an important part of the lives of VA Beach residents. However, keeping your air conditioning unit in excellent working condition can be difficult without proper training and equipment. You need an HVAC repair specialist to fix any issues you encounter. 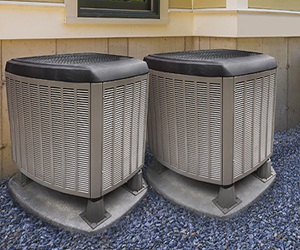 Unfortunately, there comes a point when your unit is so old and worn out that an AC replacement is more cost-effective than air conditioner repair services. However, how can you tell when your air conditioning unit needs replacing? We’ve put together a list of warning signs to let you know when it’s time to replace your air conditioning unit. If you experience any of the things listed below, don’t hesitate to get in touch with Smiley’s Heating & Cooling for your AC replacement needs. Every month, it seems like you need to call an HVAC repair specialist to request air conditioner repair services. Right after a problem is fixed, a new one might suddenly appear a couple of weeks later. An old issue that you thought was solved a few months ago might make a comeback. With these problems constantly appearing, the cost of air conditioner repair services can really stack up over time. Avoid the unnecessary air conditioner repair expenses by getting your air conditioning unit replaced instead. Aside from frequent repairs, another sign that your air conditioner needs to be replaced is the severity of the damage. If your AC has major problems with its components that are difficult and expensive to fix, it will be more cost-efficient to replace the entire unit. Have you noticed that your energy bills have been extremely high recently? It could be a sign that your air conditioner is no longer able to efficiently cool your property in VA Beach and must be replaced. Because of failing parts, low refrigerant, or other issues, your AC needs to consume more electricity to cool the area sufficiently, resulting in bigger expenses for you. A replacement might be the right solution. If you replace your AC with new equipment featuring a more energy-efficient design, you’ll cut down your energy bill significantly. On average, an air conditioner lasts around 10 to 15 years. If you’ve had your AC for longer than that, it’s time to consider getting a replacement. It’s not worth it to pay for air conditioner repair services for a device that is already on its last legs. Strange grinding, rattling, or screeching that emanate from your air conditioner are signs that your AC may need to be replaced. A properly functioning AC should operate at barely detectable noise levels. Noises are the result of serious problems, such as failing compressors and defective relays. If you are not getting cold air from your AC, it may be because of serious problems with the Freon levels or compressor. Depending on the extent of the damage, it may be less expensive to replace your air conditioner. Although condensation is normal, an unusually high amount of leakage is a red flag. Leaking coolant is a huge health hazard. If you find moisture and excessive leakage around your unit, reach out to an HVAC repair and replacement specialist to get your AC replaced. Learn about maintaining your air conditioner here. After you’ve identified whether or not you need to replace your air conditioner, you might be tempted to install your new unit on your own to cut costs. However, to make sure that your replacement air conditioner works flawlessly, you need the help of an experienced HVAC repair and replacement specialist. Installing a new air conditioner means you’ll be working with potentially dangerous gasses that are crucial to the proper function of the unit. Additionally, a professional will have the right tools to complete the job safely. Without the right skills and equipment, you could seriously harm yourself. If you choose to install your new air conditioning unit by yourself, you’ll be giving up time that would have been better spent on other things. Hiring a professional to handle the replacement lets you relax and focus on the things that really matter to you. Also, because experts have had years of experience, they’ll know exactly what they need to do to get the job completed quickly and properly. They can replace your air conditioner in a snap, while an inexperienced individual might get stuck trying to figure out which components go where. An air conditioner replacement expert will make sure that the job gets done right the first time. You won’t need to spend more money to fix a bad installation job. Additionally, you don’t have to worry about your air conditioner performing poorly because it wasn’t installed properly. Your air conditioner will work efficiently, so you don’t have to pay extra for increased energy bills. Before you can replace your old air conditioner with a new unit, you must determine the right power level required to efficiently cool the area you want to be affected. Aside from that, you need to make sure that your new AC system is compatible with the ductwork that is already in your property. A professional who is highly experienced in replacing air conditioners has the knowledge to accurately identify the factors mentioned above. You can have peace of mind knowing that your air conditioner will be replaced with the proper sizing and measuring. Now that you know the importance of hiring air conditioning replacement experts, there’s one question that may be on your mind. Which company in VA Beach should you trust to replace you AC? The answer is Smiley’s Heating & Cooling. Our team is made up of HVAC repair and replacement experts who will make sure to complete each air conditioning replacement task with dedication and attention to detail. Click here to contact us.